Having flourished as a commercial district since the Edo period, the Nihonbashi area has served as a hub for people, goods, and business. Let us first introduce Nihonbashi Bridge, a symbol for the Nihonbashi area where Sembikiya started business. Nihonbashi Bridge was built by order of Tokugawa Ieyasu in the early Edo period. Located in the center of Edo and Japan, the bridge came to be called “Nihonbashi” in the process of development and use. 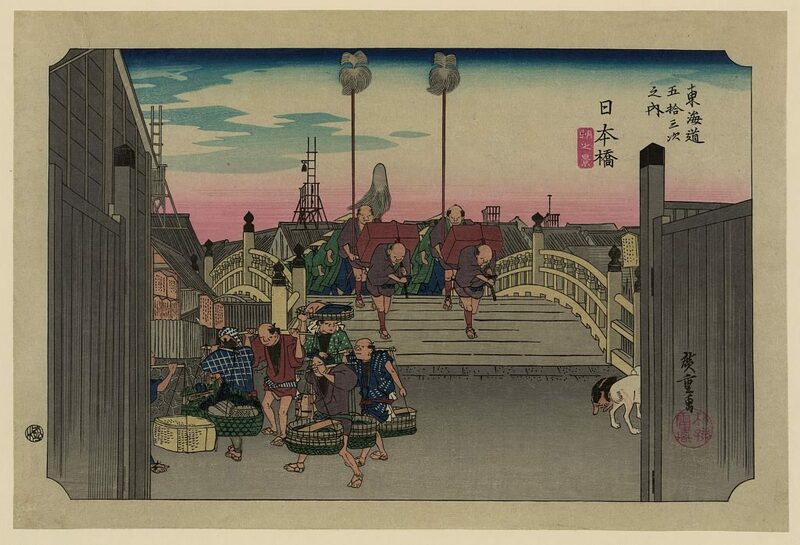 Since its formation, Nihonbashi Bridge grew to become the most vibrant area in the city of Edo as the origin of Gokaido,1 the five main travel roads, and then portrayed prominently in UKIYOE (Ukiyoe wood-block prints) by Hiroshige Utagawa and Katsushika Hokusai. The city of Edo had a population of about 150,000 shortly after the founding of the Tokugawa Shogunate. When Sankin-kotai2 started in 1635, samurai residences were constructed for the daimyo, or major feudal lords, who came to Edo from their domains, and their family members and vassals who also had to live in Edo. As more samurai families moved to Edo, the population rapidly increased with merchants moving to the city for business and people in rural areas moving to Edo seeking work. This particular time was the reason the city was once called “Edo, City of One Million People”; at its peak, the population is said to have been 1.2 million. A population of 1.2 million meant that Edo was one of the most heavily populated cities in the world at that time compared to London (about 800,000) or Paris (about 500,000) in 1801. A major contributing factor to the economy of Edo was the improvements in the transportation network. While Edo was the center of politics, most economic activities still took place in Osaka and Kyoto because Edo had not been economically developed. The shipping routes via the ocean and rivers that carried large volumes of goods connected Edo with Osaka and Kyoto. 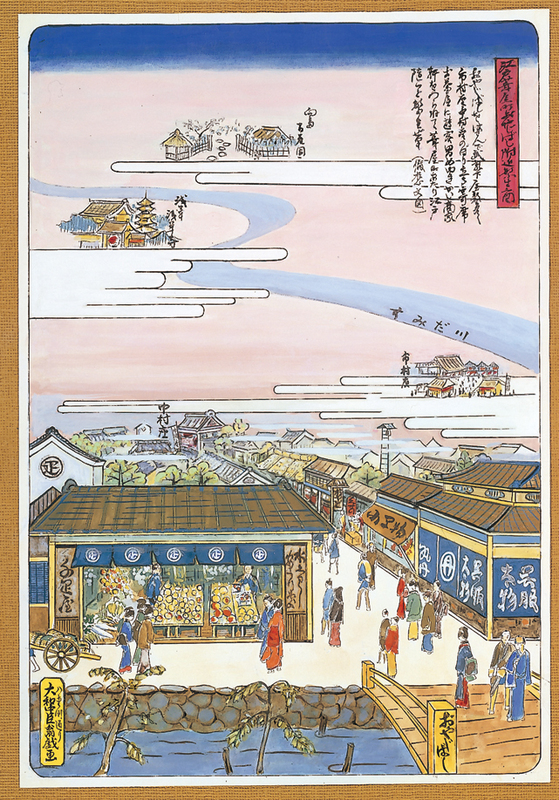 In the Edo period, the Nihonbashi area became very much alive as a wide variety of goods arrived via the Gokaido and canals from other parts of Japan and via rivers from the Kanto region. The fish market that was located in the current Nihonbashi area supported the diets of people in Edo and Tokyo for over 300 years; in particular, it developed much further in the eighteenth century. 2 Sankin-kotai was the law in the Edo period that ordered feudal lords, daimyo, to alternate living for a year in their domain and in Edo (later called Tokyo). Going back and forth required massive amounts of money; it was also a military ceremony to show the master-servant relationship between the shogun and feudal lords in the Edo period. Today’s Nihonbashi has developed into a district with people, goods, and business, where long-established companies in business for over 100 years are based in next to one another in the area. In Japan, around 100,000 long-established companies have been in business for over 100 years. Many long-term, well-established businesses are active in Japan because tradition is particularly valued. Tradition has not been preserved as it was when passed from one generation to another; it has been used for research and development in line with the times and transformed into a new product or technology. The same is true of Sembikiya. The company started as a seller of fruits and then it diversified into farming operations, breed improvements, cake shops, fruit parlors (fruit cafes), and restaurants. After all of the effort to popularize fruit consumption in Japan, Sembikiya will soon celebrate its 185th anniversary. Sembikiya-Sohonten has long existed in Nihonbashi, Tokyo, one of Japan’s leading commercial districts. In the late Edo period, people in the city of Edo experienced instability and difficult times due to starvation caused by inclement weather and rising consumer prices. Benzo Ohshima, who later founded Sembikiya, was no exception. He dwelled on the possibility of a business based on the farm products around his residence (Koshigaya). Fortunately, Koshigaya at that time had waterways for transporting goods to Edo and had favorable conditions where if you departed from Koshigaya at night you would arrive in Edo early the next morning. Convinced that farm products from Koshigaya would be popular with the people of Edo, Benzo loaded peaches, watermelons, oriental melons, and other produce onto a boat and transported them to the entertainment spot that was once called the best in Edo. He finally set up a stall in 1834, the birth of today’s Sembikiya. As time went by, Sembikiya expanded its network of connections in politics, business, and literature, as well as with government officials. 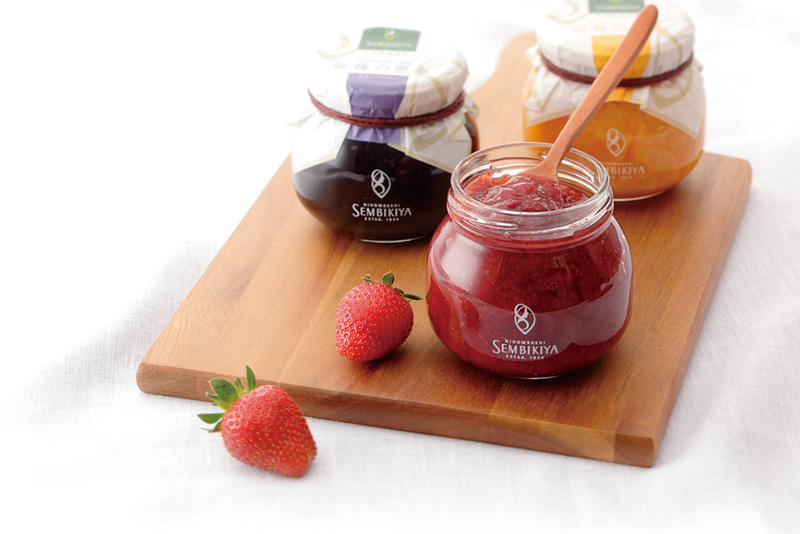 As the ranks of customers went up, Sembikiya started to focus on the quality of the fruits. At that time, when the means of transportation and techniques for the preservation of fruits were not as mature as today, it was not easy to secure high-quality fruits. 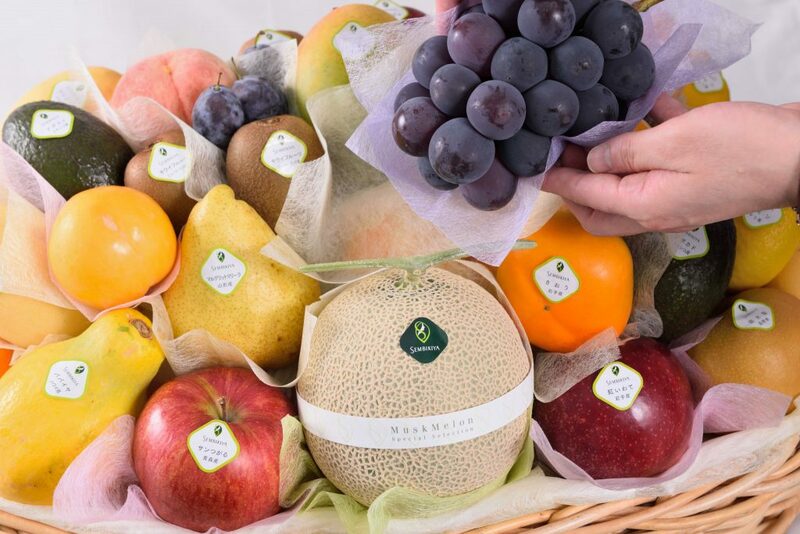 Because of the company’s passion for quality fruits and support from the upper classes who were regular customers, Sembikiya became a purveyor to the ruling Tokugawa clan. Later, the company shifted its focus to luxury products. With the transition from the Edo to Meiji eras, the central government started to actively introduce Western systems, technologies, and cultures to facilitate modernization. This policy resulted in a substantial change to the manners, food, clothing, and housing of the people of Japan. Westernization spread rapidly among the lives of the upper classes and in urban areas; people came to strongly aspire to the cultures of foreign countries while watching the streetscapes of changing cities and the elegant behavior of ladies and gentlemen. In its effort to be the first to move with the times, Sembikiya cast into shape the idea that it had cherished for years. The company opened a fruit restaurant in 1868 as a place where customers could enjoy Western food and desserts in a casual setting. The restaurant later became the first Fruit Parlor, which is a fruit cafe. Fruit Restaurant offered strawberry milk, fruit punch, ice cream soda, shortcakes, and fruit sandwiches, among other items. These offerings were the restaurant’s main attractions, which most Japanese had never seen before. People were fascinated that the main dishes came with fruit in the novel and stylish atmosphere of the restaurant; Fruit Restaurant became a great success. In the early Showa period, the name of the restaurant changed from Fruit Restaurant to Fruit Parlor (Fruit Cafe); the additional offerings created at that time included curry blended with mango and hashed beef stewed with pineapples, and these are still popular at Fruit Parlor today. 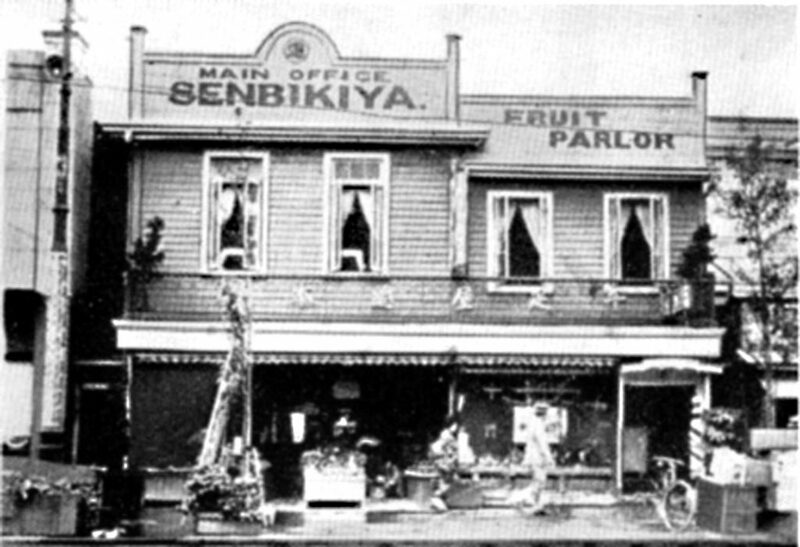 The common factor among Sembikiya’s Fruit Restaurant and Fruit Parlor (Fruit Cafe) is that the owners, fruit pastry chefs, and kitchen chefs were sensitive to the changing times and had an enterprising spirit that allowed them to think ahead of the times. 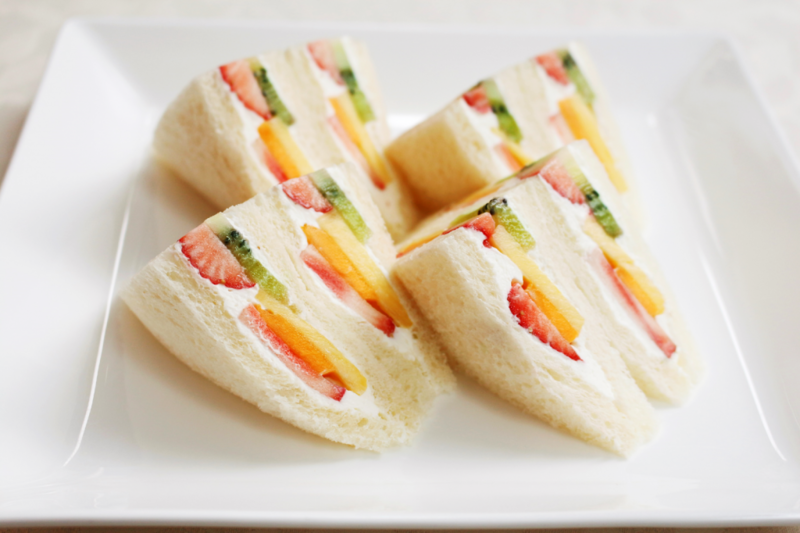 For example, fruit punch, shortcakes, fruit sandwiches, and mango curry remain popular offerings after all these years. In Japan, there is a cultural tradition of giving mid-year (July) and end-of-year (December) gifts to those to whom you are indebted. To understand why food is often selected as gifts, you need to look back to one aspect of Japanese history that has been passed down from ancient times. This is about how Japanese people traditionally care about the person to whom they feel grateful as well as the origin of the sense of hospitality that exists today. Since ancient times, Japanese people have traditionally worshipped gods or their ancestors twice a year. During these periods, people offered food and prayed for a good harvest. People believed that sharing the food offered to a shrine with others would ensure connections to the gods and ancestors. This custom led to another custom of sharing the offering with the participants in the rituals as well as family members and people in the community. After that, the custom of giving gifts emerged from the social customs of splitting and delivering in addition to sharing. Starting as the custom of sharing an offering to a shrine, the custom of giving gifts took root as events where gifts were sent to relatives, supervisors, and acquaintances who were elders or people with a higher social rank. Particularly after the Meiji period, the Japanese economy grew rapidly, the scope of relationships expanded as the population increased, and the custom of sending gifts was promoted through TV, newspapers, and other media. These are part of the reasons why Ochugen and Oseibo (giving mid-year and end-of-year gifts) have taken root in Japan. People today have many choices of gifts and products to choose from, including online commerce. It may look as if the situation would undergo a great change, but one thing remains the same: the sense of gratitude and caring for the other person. Many people nowadays want to send carefully selected gifts that make the recipients find valuable. 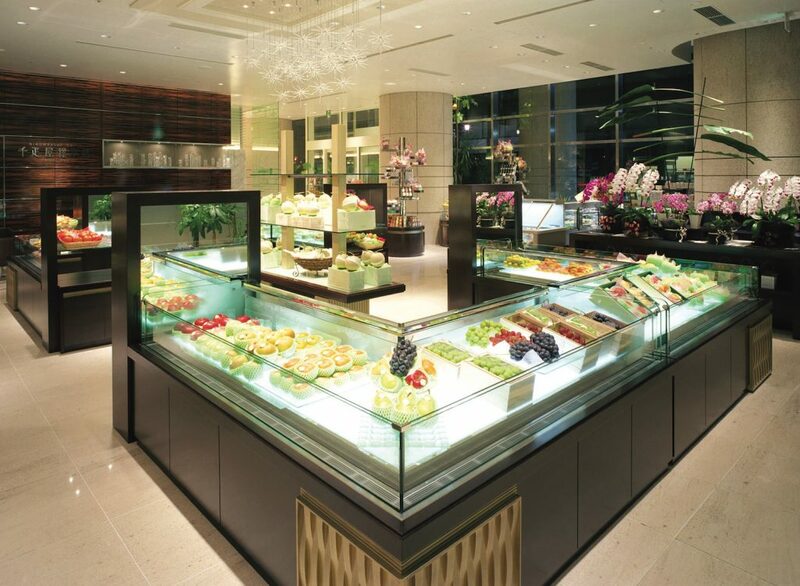 Sembikiya-Sohonten responds to the customers’ sense of warm-heartedly caring about the other person and wanting to pick good gifts and so offers high-quality fruits, sweets, and desserts carefully made with fresh ingredients. We hope you enjoy the uniquely developed food culture of Japan and try the world’s top-quality fruits that Sembikiya offers. The most famous offering from Sembikiya is muskmelon, which is said to be the king of fruits and ranked highest among many various kinds of melons in terms of taste, scent, and appearance. Sembikiya shops only offer muskmelons grown in Shizuoka, which generally gets more sun than other areas in Japan and where the weather is warm. But, there is more to it than great weather; Sembikiya’s muskmelon, which is ranked the best, is the result of day-to-day efforts by the farmers to carefully control cultivation and who treat the produce as a treasure. 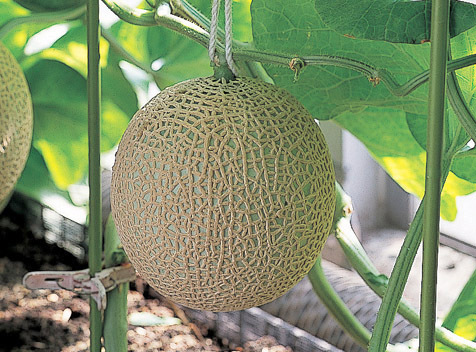 In order to keep the fruit from absorbing excess moisture, each melon is suspended above the ground, and the air temperature in the greenhouse is controlled accordingly. By preventing the melon from absorbing excess moisture, the rich flavor and scent can be enjoyed to the fullest. Only one fruit is yielded from one stem; all other fruits are picked in advance. Limiting the number of fruits per stem to one prevents the dispersion of nutrients from the soil and stem and allows it to concentrate in the fruit. While vinyl greenhouses are generally used in Japan to grow fruits and vegetables, the muskmelons produced in Shizuoka are grown in glass greenhouses. Glass greenhouses have higher sunlight transmittance, which is the most appropriate for the cultivation of muskmelons that grow best with light. In addition, the south-facing roofs of the glass greenhouses is relatively larger to admit more light into the inside even during winter when the position and angle of the sun is much lower. The farmers in Kagawa grow Queen Strawberries for Sembikiya, and they spare no effort in paying delicate attention to the care of them to make our customers happy because of the taste. The strawberries we deliver are crimson and shiny as gems. With the increasing popularity of sweet strawberries, many branded strawberries are available in supermarkets. However, Sembikiya’s strawberries are more than just sweet. Based on the philosophy that the strawberries of a fruit specialty store must combine moderate acidity with the appropriate color, glaze, and shape, we searched everywhere in Japan and finally found the ideal group of farm producers in Kagawa Prefecture with the help of many people in the process. 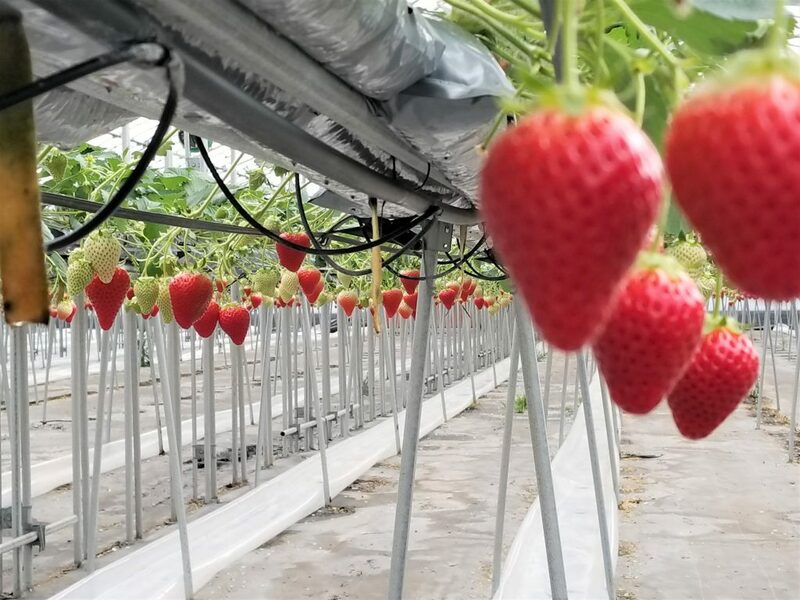 Out of so many strawberries that are grown in the contracted greenhouses, Sembikiya carefully selects a very limited number that have met all requirements. Accounting for only 3% of all strawberries grown there, the Queen Strawberry has become the leading product for Sembikiya in winter. For maximum sunlight, our farm producers use vinyl, highly light transmissive material, and cover the greenhouses with a single film, instead of two to allow sunlight to pass through. These greenhouses are equipped with heating equipment to protect the fruit from low temperatures. The greenhouses need to maintain room temperatures that are not too high or too low. When the temperature goes up, a large fan installed in the upper section of the greenhouse automatically activates for ventilation. When the temperature drops, heaters are automatically activated. In particular, careful attention to temperatures is required in early spring because it could easily go up. Elevated cultivation means the fruits do not come into contact with the soil. Since this condition is preferable from a hygienic standpoint and creates fewer shaded areas, fruits grown with this method are evenly colored and glossy. Our producers have a system in place where the strawberries automatically receive fertilizers and water according to the amount of solar radiation, which allows them to thrive in a non-stressful environment. Excess leaves are pruned to make sure that they do not block the sunlight shining down from the top. While many fruits grow from one strawberry plant, all unnecessary fruits are thinned while they are buds so that only the nice-looking ones receive sufficient nutrition. 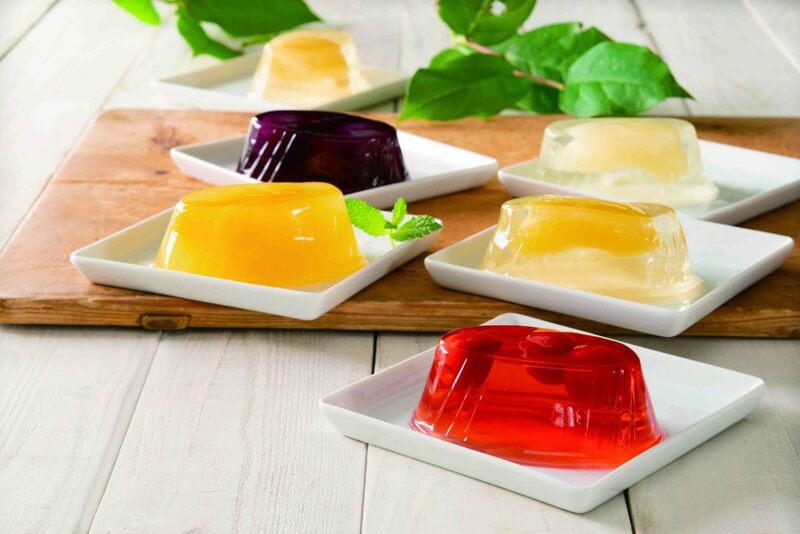 Ripe fruits are cut into big pieces and mixed into a brilliant jelly. Choices include peaches, pears, cherries, and grapes. The characteristics of each flavor are maximized in the finishing process. It is a longtime seller with beautiful fruity flesh sparkling like gems. 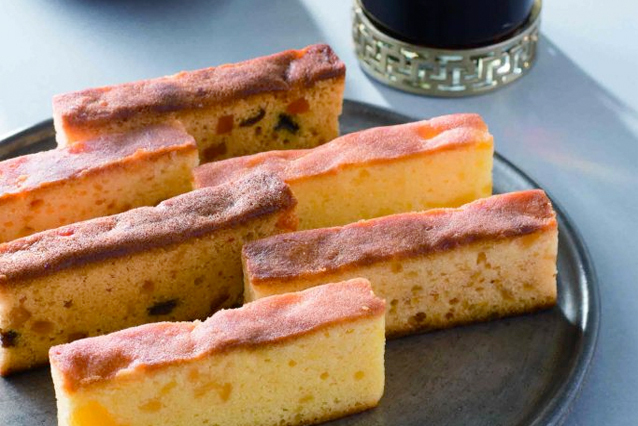 The moist cake is filled with orange peels, lemon peels, dried cherries, and raisins. Take a bite and you will smell the sweet scent of honey mixed with the fragrant scent of dried fruit. The cake is characterized by the elegant sweetness of dried fruit and the personalities of the ingredients. In this baked confectionery, fruit plays a leading role. “Mille-feuille” means “thousand leaves” in French. For Mille-feuille Blueberries, the balance between rich-tasting and bittersweet chocolate and the sour taste of blueberries is carefully calibrated, and sweet-sour strawberries add an accent to the milky white chocolate in Mille-feuille White Strawberry. In Mille-feuille Yuzu Matcha, the profound and original flavor of matcha is in harmony with the delicate yuzu (citron) scent. Mille-feuille contains these ingredients within the smooth puff pastry layers and the rich, extremely smooth chocolat. This popular product is available for a limited time only. Premium Jam is additive-free. Carefully selected fruit is thoroughly simmered with beet sugar and lemon juice. 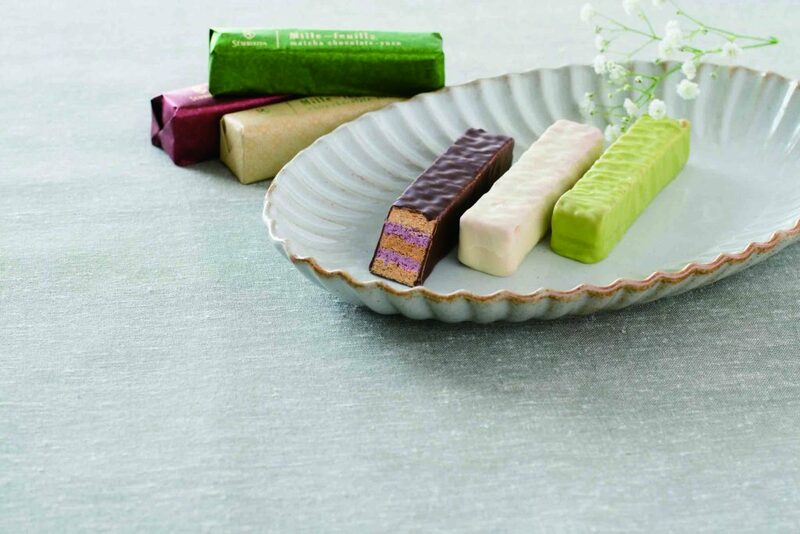 Refined Japanese sugar is added as a hidden flavor, whose fresh sweetness brings out the original taste of the fruit. Even more than the taste, the abundant fruity flesh makes you feel like you are eating the fruit itself. It is literally a premium jam. This additive-free juice has a rich, luxurious flavor that only a fruit specialty store can offer. 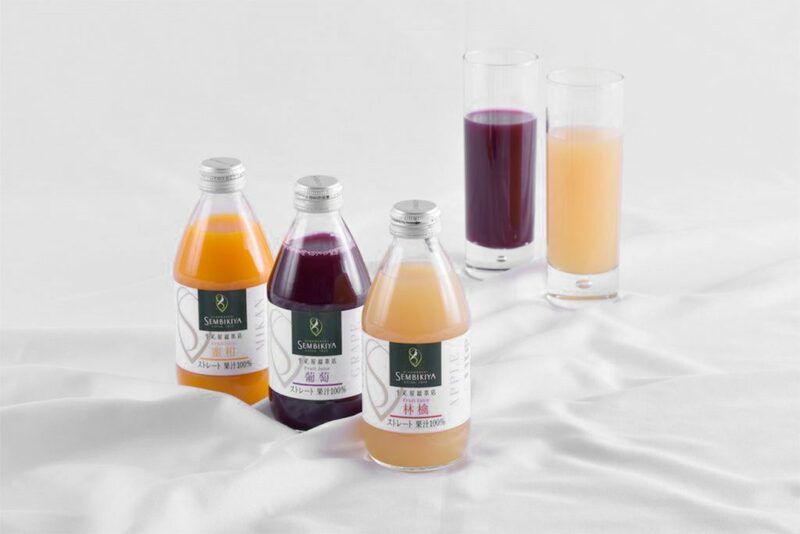 This is a 100% juice beverage of the size that can be consumed at one time so that you can enjoy fresh flavor at any time. Three flavors are available: tangerine, grape, and apple. The main store is based on the concept of a fruit museum and a fruit gallery. You can overlook the whole floor for a real sense of openness. The showcase contains neatly displayed fruits at a relatively low level so that visitors feel as though they are looking at exhibits in a museum. Please enjoy appreciating the top-grade fruits gathered from all over the world as much as you want. In one corner of the store, a framed signboard from the early Showa period is exhibited as artwork. It is nice browsing in a store that combines a very bright space having both a modern taste and a warm touch of history. Sembikiya not only offers the highest quality fruit as gifts but also transforms the carefully selected fruit into cakes and desserts. Please try Sembikiya’s sweets because they are well thought out so as not to spoil the original taste of the fruit. 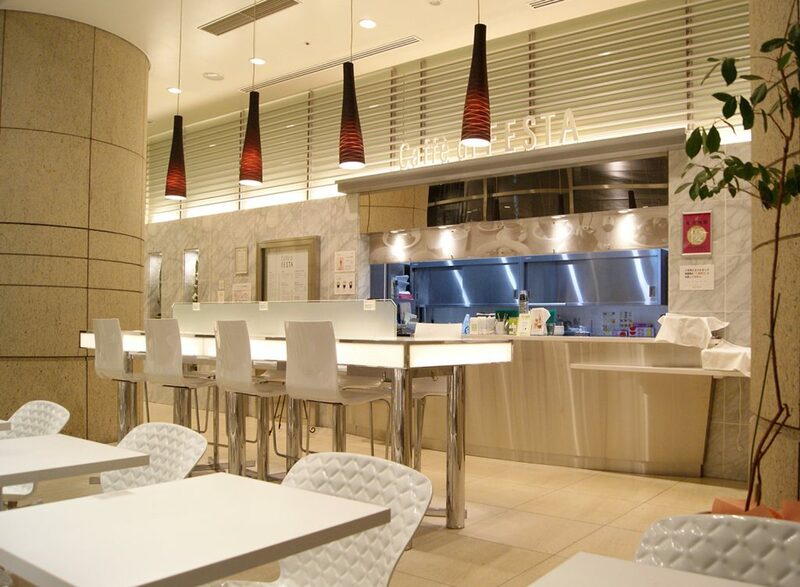 The glass-walled cafe is a white-focused, bright space with an open atmosphere. Outdoor seating is also available, which adds a relaxing touch. This is the perfect place for you to read books on a sunny day or enjoy a cup of tea with friends. 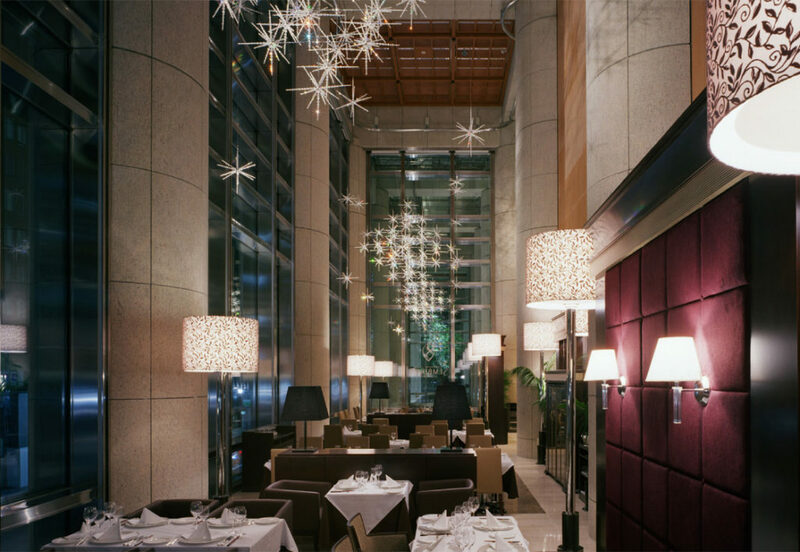 From the moment you enter the parlor, you will see the gorgeous Swarovski-encrusted chandeliers. They are suspended from a high ceiling like a great cathedral; countless glittering lights elegantly brighten the room like lamps. 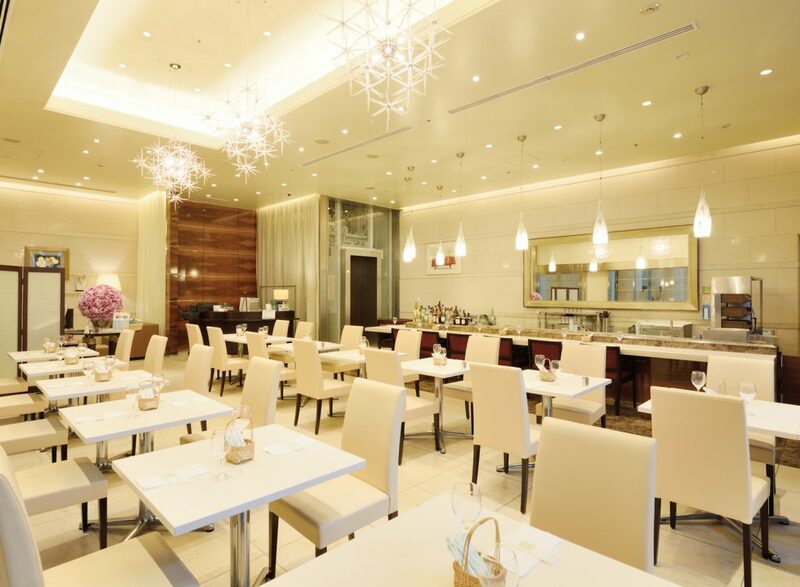 The white-based seating space in Fruit Parlor creates a bright and clean ambience. Please enjoy the great dishes and desserts in the shiny, gorgeous space for significant anniversaries or special dinner parties. The fruit served here boasts the quality that only a fruit specialty store can offer. Specially selected from all over the world, fruit is cut quickly by experienced staff. Their light style of handling fruit brings out 100% of the seasonal flavor. You can experience the fine flavor of Sembikiya’s popular traditional cuisine in a well-established Western-style restaurant. 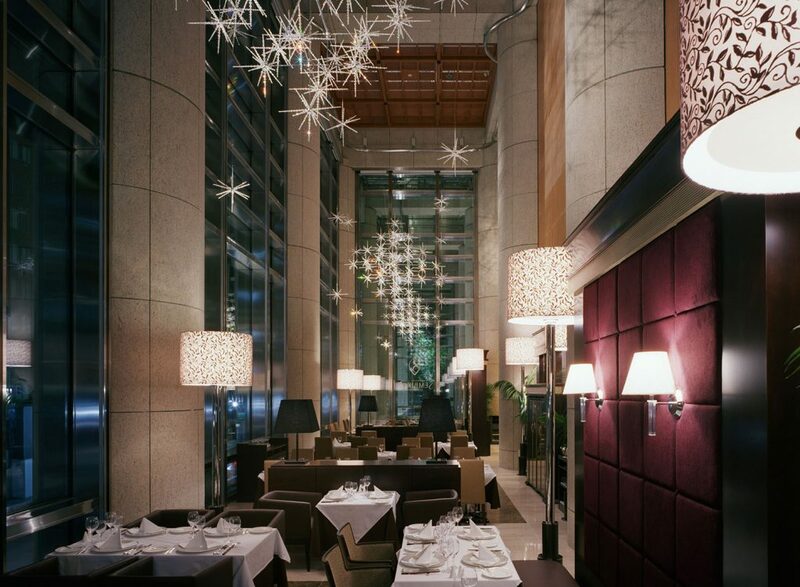 In the all-glass atrium at the back of the restaurant, a full-course dinner is served. The ingredients for this seasonal specialty are passionately selected, and seasonal foods are skillfully picked. 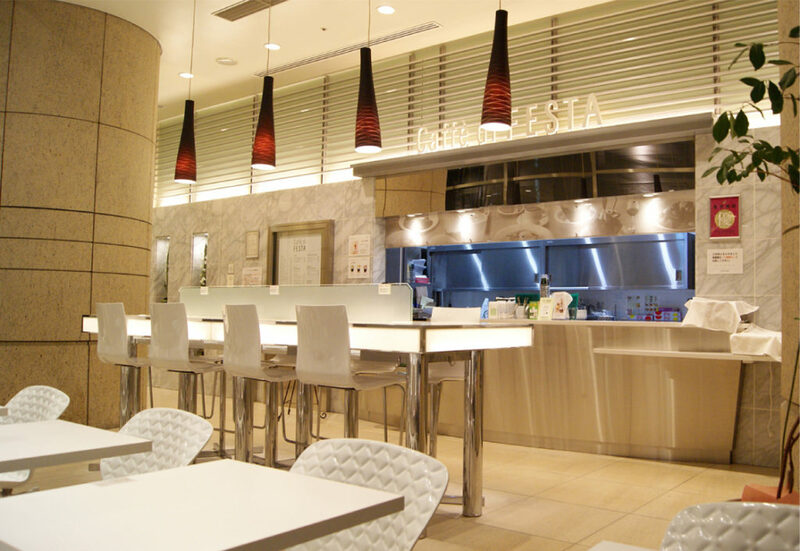 A wide variety of Western food is on the menu so that people in different age segments from small children to the elderly and families can gather in a casual space. We are confident that first-time customers will be satisfied with what we serve. Business hours are subject to change without notice depending on the status of booking for private parties or weather conditions. Smoking is not allowed on any of the floors whether in merchandise or eating/dining sections. Free Wi-Fi is available in the merchandise and eating/dining sections. Payments may be made in cash, credit card (including UnionPay), or e-money. Pay afterwards. English-speaking personnel are available. Let us know if you have questions about the menu. The indicated prices in the shops and on the menu are all tax-inclusive. Duty-free items are available on the merchandise floor if you want to purchase souvenirs to take back to your country. Purchasers must present their passport for the duty-free procedures. As fruit is perishable, please consult our staff if there are some more days left before your departure from Japan. No pets are allowed inside the shops (except for guide dogs). After passing through the underground passage from the Tokyo Metro Ginza Line of Mitsukoshimae Station, you will find the entrance to Nihonbashi Mitsui Tower right next to the stairs leading to the ground (A8). Turn left at the entrance, and you will see the Sembikiya-Sohonten elevator on the right. This elevator takes you directly to the fruit section and Cafe di FESTA on the first floor and Fruit Parlor (Fruit Cafe) and the restaurant on the second floor. We hope you enjoy the shop. After passing through the ticket gate at Shin-Nihombashi Station, turn left and go straight through the underground passage. At the far end, turn left and go straight. You will find the entrance to Nihonbashi Mitsui Tower right next to the stairs leading to the ground (A8). Turn left at the entrance, and you will see the Sembikiya-Sohonten elevator on the right. This elevator takes you directly to the fruit section and Cafe di FESTA on the first floor and Fruit Parlor (Fruit Cafe) and the restaurant on the second floor. Walk toward Nihonbashi from the Kanda Station exit (South Exit). Go straight along the main street (Chuo-dori). After a 10-minute walk, you will see Nihonbashi Mitsui Tower, the highest building in the neighborhood. Mandarin Oriental Tokyo is also situated in this shopping complex. Note: If you get lost, ask for directions at the koban police box located in front of the Kanda Station South Exit. Copyright 2019 Sembikiya-Sohonten, Ltd. All rights reserved.